We are at the exciting and nail-biting end of the football finals here in Victoria, with the AFL (Australian Rules Football) Grand Final happening next Saturday, 31st September. As I was watching the semi-final last night on TV, lamenting my team Hawthorn going down by a heart-breaking three points to that much hated team Collingwood, I was also sort of contemplating what I should blog about this week. So with football on my mind, it seemed sensible to dedicate this to all the football jumpers I have knitted before (or at least the still ones around to photograph). When the kids were little, I made them each of them a football jumper. The girls barrack for Geelong football club like their father. Supporting Geelong is compulsory in my husband's family. It's genetically coded into their DNA and I'm sure the Geelong supporter's kit is supplied with their birth certificates. However, I vividly remember taking my eldest daughter to her first AFL football game and her barracking loudly for the umpires rather than either of the teams. She felt she should cheer for them as every one else was being nasty to them. The girls' jumpers were one of my few attempts at machine knitting. I inherited a hand me down knitting machine from an Auntie. The knitting macine was always a little cantankerous and inclined to jam at inopportune times, so this is one of the few fully complete things I can remember doing with it. These jumpers are made out of 8 ply acrylic yarn and were sort of made up as I went along as I didn't have a pattern. Of course you need to have the number of your favourite player on the back of your jumper. The eldest daughter wanted number 32 on her jumper, the number of Garry 'Buddha' Hocking. Buddha was a colourful player with a massive curly mullet and a hard-as-guts playing style, often leaving his opponents slightly the worse for wear after bruising encounters. It's probably not surprising that the photo I found of Buddha has him slightly blood splattered. However, Buddha was just at the end of his career when I made this jumper so she compromised on Number 36, her second favorite player. The other daughter, Mel, had Gary Ablett Snr's number 5 on her jumper. 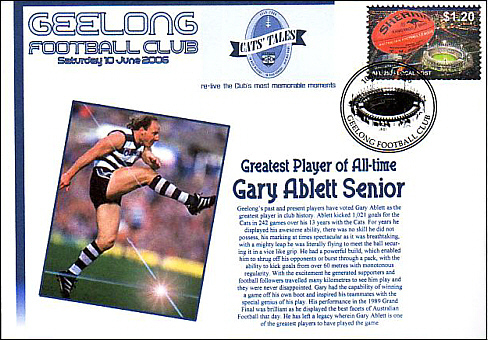 Gary Ablett was 'God' to Geelong supporters. He was a fantastic player, capable of the spectacular mark, the sweeping run down the wing and the miraculous goal. However, when you think about it, it is somewhat scary that my girls' favourite players were nick named Buddha and God. 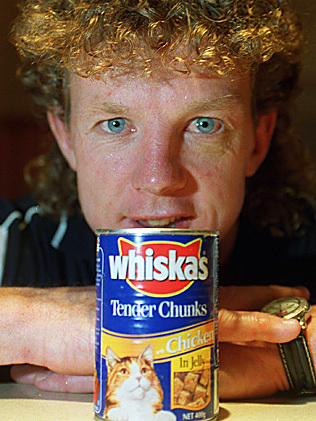 There was definitely something semi-sacrilegious going on at Geelong in the early 90's. The eldest daughter's jumper ended up as 36, as this was the initial number of Ben Graham, her second favourite player who was the Geelong Captain before he retired and went off to become a punter in the NFL in America. (Though by the time Ben was Captain, he was number 7). Both the girls had their Geelong caps signed by him. Ben was an awesome kick, often kicking half the length of the field, regardless of whether he was playing forward or in the backline. There was also a slight chance that the number on the girls' Geelong jumpers would be a 1/2 as this is the number on the jumper worn by the Geelong football club mascot, Half Cat. Getting hugged or high-fived by Half Cat is awesome. However, when the son came along, I had a win, managing to brainwash (sorry persuade) him to barrack for the same team as me, Hawthorn. His second footy jumper was hand knitted from a pattern clipped from a magazine. It is knitted on 4 mm needles in 8 ply acrylic yarn. The boy has a number 2 on his jumper. This was Nick Holland when I first made the jumper and in the current team line up it is Jarryd Roughead. Both are centre half fowards, good marks and strong if occasionally inaccurate goal kickers. When Nick retired and the number was passed on the Roughead, the boy saw no need to change his number. (It probably helps that Roughhead is from our general area and played for the Gippsland Power Under 18 team). You need to have a tough skin if you are a Hawthorn supporter as everyone else picks on you about the ugliness of the colour combination of the Hawthorn jumper. There are also nasty toilet humour comparisons made about what else is yellow and brown. 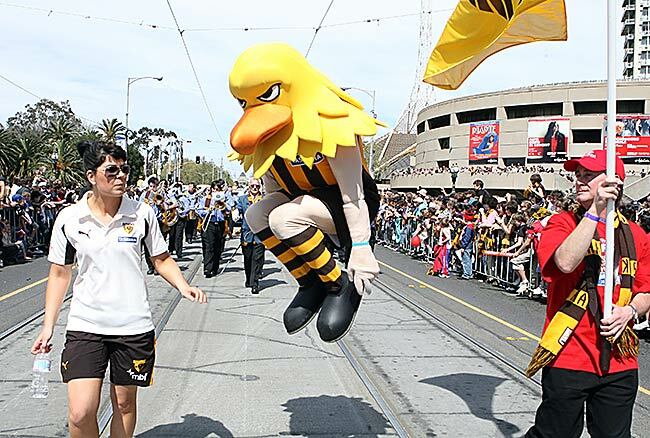 However, out mascot, Hawka, is awesome. The kids have grown considerably since I knitted these jumpers and at least one of them now has a 'real' football jumper. The boy was sitting on the couch with me last night, sort of watching the football from behind a cushion whenever the tension got too much, and said it was about time I knitted him a new football jumper. However he wants an away strip one. How do you fancy my chances of pulling this one off? Just a postscript. Geelong were victorious is the 2011 AFL grand final! And for the eldest daughter - "Go Mackie!"